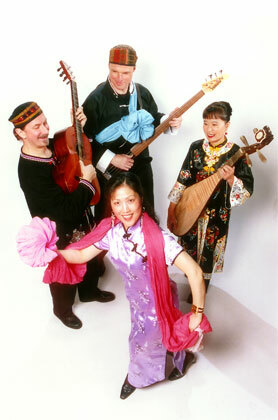 Silk Road Music is a professional ensemble that has been touring since 1991. It has garnered fantastic reviews from audiences and media for its virtuosic skills and artistry. It is a leading force of Chinese/Canadian music in Canada. Appearances in a wide range of venues including International Jazz Festivals, the Commonwealth Games in Malaysia, a BBC recital in England, hundreds of schools, community concerts around the world. Their last two CDs have each won West Coast Music Awards. Their CD, Endless, was also nominated for a JUNO award. The latest album Autumn Cloud is already widely acclaimed for it’s outstanding quality and universal vision. It was nominated for the Best Ensemble and Pushing the Boundaries categories at the Canadian Folk Music Awards in 2006. Silk Road Music has taken Chinese music into a bold and innovative direction by combining traditional techniques,Western harmony and a great understanding of world folklore. Their exciting live performances brings joy to children and adults, transporting them from Orient to Occident, experiencing a refreshing look at the extremely versatile Chinese instrument-pipa. Noteable Entertainment & Events is a Vancouver based booking agency, party rental, entertainment services and event production company. If you are interested in booking Silk Road please contact us.